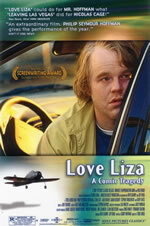 The Story: Love Liza is about a man in trouble Wilson Joel. There's a searing pain in his gut that he can't tolerate and a dazed quietness to his struggle as he tries to maintain his equilibrium. Wilson is attempting to move on from the sudden and inexplicable suicide of his wife. His mother-in-law is there for him, but her sympathies turn quickly. He has an employer that seems to want to help him, and a workmate who wants him for herself. But nothing and no one can give Wilson solace; so, he seeks oblivion. It is not the usual alcohol or drugs. Wilson inhales fumes from gasoline cans and model airplane fuel and finds temporary salvation in the company of remote-control model enthusiasts. However, nothing that provides him relief really lasts. Love Liza is a dark film. But it is also a brave, insightful and compelling one for those willing to enter its world. It may not be easy to watch, but it is probably harder not to.